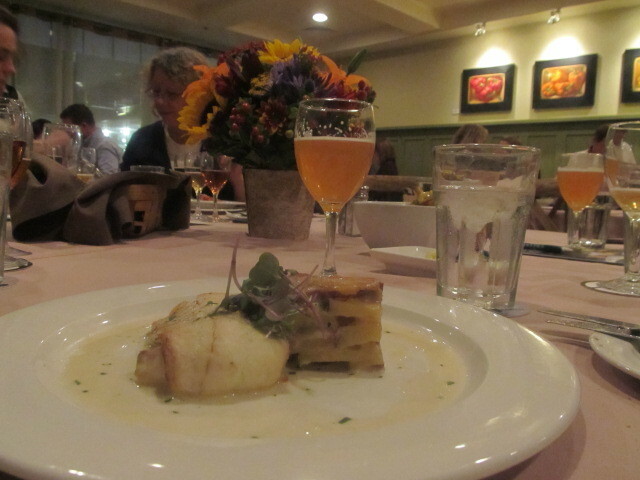 Seared Fluke with Robinson's Farm Swiss Au Gratins and Fisherman's Sunrise Saison. We were recently invited to the Massachusetts Cheese Guild Dinner at Henrietta's Table In Cambridge, sponsored by Robinson's Farm Cheese and Cape Ann Brewing Company. The spot was a favorite haunt of Julia Child who lived just down the street and could often be seen brunching here. Under the watchful eye and hands of Chef Peter Davis the restaurant has been doing farm to table dinners for many years before it became trendy, then expected. It was also great to finally meet and enjoy dinner with Tiffany from the highly popular @BostonFoodies on Instagram. Of course, I had to mention that I was THE Boston Foodie. In addition to the fluke pictured above we dined on Roasted Beet Carpaccio with Prescott Cheese and Fisherman's Brew. Then there was an excellent Grilled Balsamic Portobello with Barndance Cheese and a Fisherman's Pils. It was also a long overdue opportunity to learn about all of the wonderful artisinal cheeses being produced right here in Massachusetts. The Cheese Guild was recently formed to get the word out that one doesn't have to go to Vermont to find a plethora of great cheeses, many award-winning. We're predicting that there is going to be a lot of locally-produced cheese featured on menus throughout Boston in the coming year and with this level of quality we heartily approve.